Pencil Kings » Blog » Podcast » PK 157: Creating Your Own Comic Books. Interview With Spider-Man Noir Co-creator, Fabrice Sapolsky. Ever wanted to know more about creating your own comic books? In this week’s interview, we speak to Fabrice Sapolsky, co-creator of the Spider-Man Noir series published by Marvel. You’ll hear how he went from growing up as a French kid who was crazy about American comics to working with highly-acclaimed fellow writers and artists such as David Hine and Carmine Di Giandomenico. But this interview is not about becoming an overnight success story in your chosen creative field. It’s an open and honest account of what it’s really like to work in the comic book industry, including the many struggles and hurdles faced by most freelance creators. So, if you’ve got an idea for a comic book that you’ve been itching to bring to life, you’ll find stacks of straightforward advice in this interview to relate to. Creating Your Own Comic Books – Advice From Fabrice Sapolsky. Your host, Mitch Bowler, introduces today’s guest, comic writer Fabrice Sapolsky. In this chapter, he talks about growing up in France, and how his love of American comics led to him working in the industry, co-creating Spider-Man Noir, and eventually moving to the USA to further his career. 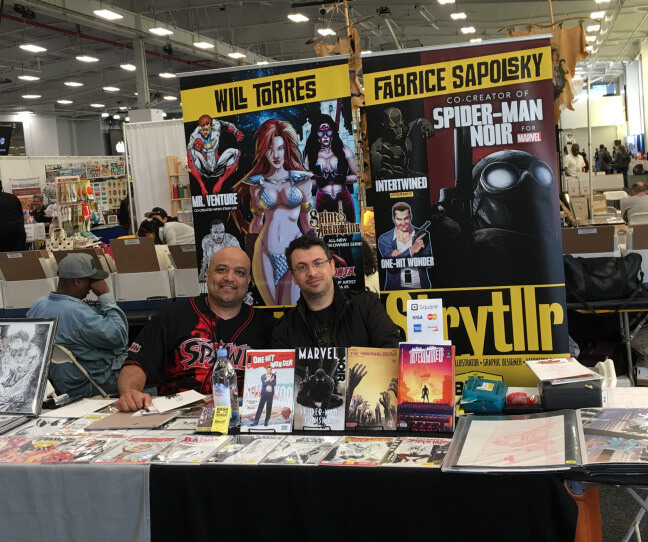 What Made Fabrice so Determined to Work in the Comic Book Industry? Lots of young creatives dream of working in the comic industry, but how do you find the determination to turn that dream into reality? In this chapter, Fabrice reveals what kept him motivated during his early years, and eventually led to co-creating Spider-Man Noir – one of the highlights of his career so far. How Did Fabrice Turn his ‘Impossible Dream’ Into Reality? Having the dream and working hard to reach your goals is one thing, but there are often many other factors to consider when carving out a career in the creative industry. In this section, Fabrice expands upon some of the key points in the previous chapter and reveals how the comic book industry has changed since he first started working in it. Why Does Fabrice Believe Creator-Owned Comics are the way Forwards? Having worked in the mainstream comic book industry and seen how it’s changed over the years, Fabrice is now a strong believer in the creator-owned comics movement. In this chapter, he explains more about this exciting initiative for creatives, and how online platforms such as social media can open up new doors and possibilities for you if you’re thinking about creating your own comic books. How can you get Started With Your First Creator-owned Comic? Want to start your first creator-owned comic project? In this chapter, Fabrice shares stacks of useful advice to help you get your ideas out of your head and onto the paper. You’ll learn about the importance of developing a strong work ethic, and why networking with a supportive community of fellow creatives can open up all kinds of possibilities for you as an artist or writer. Mitch wraps up today’s interview with Fabrice Sapolsky, who offers even more gems of advice about creating your own comic books. You’ll find out where to find him online, hear about which comic cons he’s attending…and you’ll also be the first to hear about the exciting news for fans of the Pencil Kings podcast! We hope this week’s interview with Fabrice has helped you learn more about creating your own comic books. Perhaps you’ve got some ideas for your own comic book or graphic novel already? If so, tell us about them in the comments section below – we’d love to hear from you!